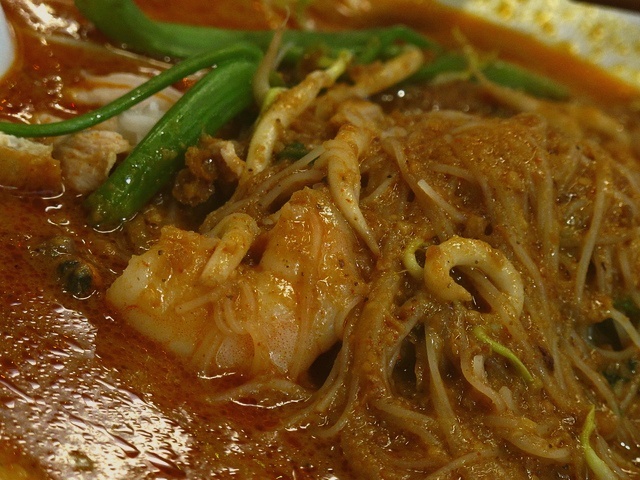 Satay bee hoon is a dish of the cultural fusion between Malay and Chinese. Satay bee hoon sauce is a chilli-based peanut sauce very similar to the one served with satay. Blanch soaked rice vermicelli in boiling water to wash away the starch and to loosen them up, about 3 minutes. Drain. Blanch cuttlefish, kang kong, bean sprouts, chicken slices, prawns and lastly the fresh cockles in boiling water. Remove and drain. Transfer bee hoon to a serving plate. Ladle the hot Satay gravy over rice vermicelli. Garnish neatly with blanched cuttlefish, fried crispy tau pok, kang kong, bean sprouts, chicken slices, prawns and fresh cockles. Serve and eat while its hot.